I’m really excited to announce we’ll be running a playscheme this summer at the garden so if you know any 7-14 year olds who like making fires, building shelters, sculpting clay, outdoor cooking in our pizza oven, running around outside and loads of outdoor FUN then get them booked on. It’s running for five Tuesdays from 30th July and is £25 for 10am – 4pm which includes a delicious outdoor cooked lunch! Please spread the word! Places are limited to 16 per day and booking is essential. We also recruiting a play leader to run the sessions with me (see http://www.voscur.org/jobs/64761) so if you know anyone qualified and dynamic let please pass it on!! AND we’re building our pizza oven Saturday July 6th, and July 2ord 10-4. It’s free but you have to book a place as places are limited. If you don’t let me know and just turn up on the day it’ll probably be fine but be aware you might not get the chance to get involved if there’s too many people. 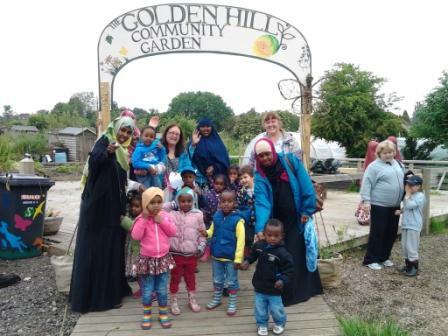 The garden is currently buzzing with life, the courgettes coming through in the polytunnel, the tadpoles growing legs in the pond and as the word spreads all sorts of groups are coming from all over the city and getting involved – adults with learning difficulties from Soundwell! pond dippers from St Judes! The weekend’s howling winds may have knocked our lupins for six but it’s onwards and upwards towards the golden summer!! This entry was posted in News from the Garden on June 20, 2013 by GHCG. Okay there’s so much fabulous stuff going on! firstly…. *drumroll*… Pete and co and have only gone and done it and the Tower of Power and the solar pump WORKS! It wasn’t easy but water from our 750l tank has been pumping up the hill to the 6000l tank at the top and our tank replenished by ground water. This sunny weekend the mains water was turned off and the plot holders have been watering with our water! Hat’s off to Pete Clee for his maverick vision and hard work. 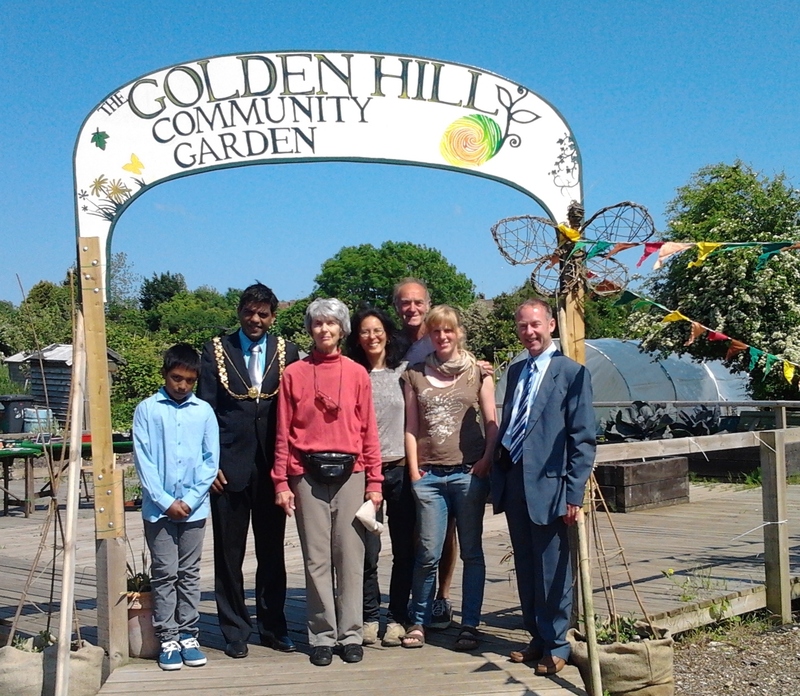 There’s still a few glitches to be worked out but the Lord Mayor Faruk Choudhary and Steve Clampin (Bristol City Council Allotments Manager) came to the Get Growing Trail on Saturday and were very impressed. I’ll put a page up on the website with more details of the system soon. And on Saturday the sun shone and we were open for volunteer and visitors on the Get Growing Trail and we raised over £100 selling cakes and plants! This seemed like a tidy sum until I got home and checked my email to find out it looks like we weresuccessful in our funding bid to get money to build a proper shelter. WHOOOP!! We’ve a few formalities to go through but thank you to the National Lottery Awards for All (and to everyone who buys lottery tickets) for £8700! The building will be a vital part of making our garden more accessible to people who want to be involved all year but can’t really cope with the cold weather- sometimes even our hardiest volunteers have had to leave sooner than they’d like because of feet so cold they hurt. This winter we’ll be able to sit back, drink tea, leaf through seed catalogues in our cosy cob building and wriggle our toes in front of the stove. Of course we’ll have to build it first and that’ll be the fun part! Anyone with any interest in eco building get in touch. It’ll be a community effort and an amazing learning opportunity and we’ll probably get started in September. 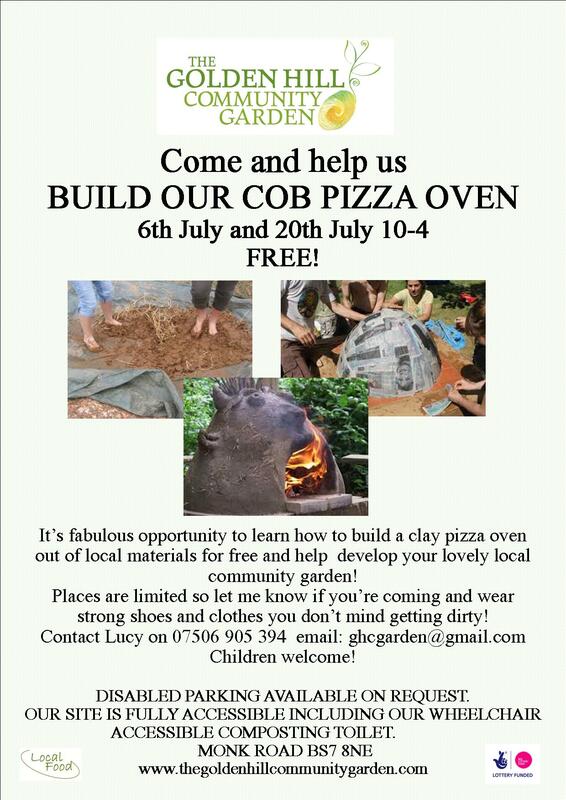 MORE exciting up and coming dates, still there’s still a few places left on the Pests, Diseases, Weeds and Problems workshop on the 23rd June AND the cob pizza oven building is still planned for 6th July and 23rd July 10am – 4pm – an great opportunity to learn how to make a cob pizza oven for free!! But numbers are limited so let me know if you want to be involved! 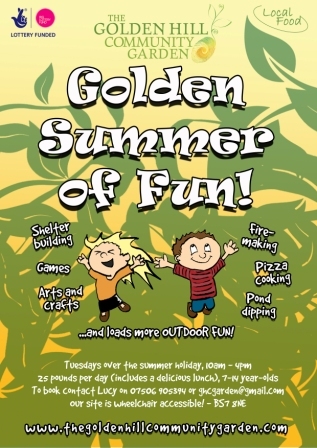 Okay this post is already too long so I’ve save the info about the summer playscheme for 7-14 year olds for the next one and I’ll just quickly finish by saying a worker from Freeways supported housing recently described the Golden Hill Community Garden as place where “Everyone values everyone and nobody judges anyone”. That’s something for all of us involved to be really proud of, and if you’re not involved yet- come be part of this special place! 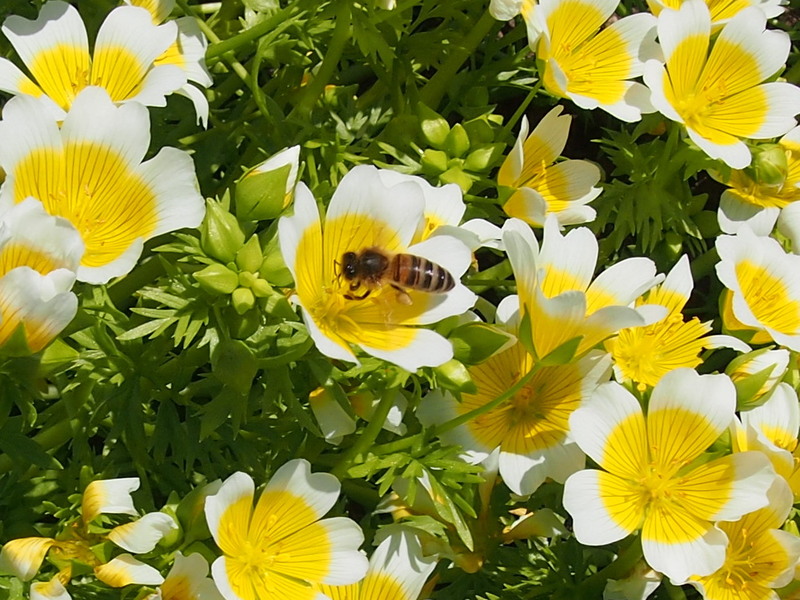 This entry was posted in News from the Garden on June 11, 2013 by GHCG. This Saturday 8th June is our usual open Saturday 10-3 and we’re opening as part of the Get Growing Trail. It’s a fab city wide weekend long event when loads of community gardens open their doors (including the community orchard on the same site as us !full details at www.bristolfoodnetwork.org). I see from the leaflets that we have promised “Cakes and plants for sale as well as tours, chats and pond dipping for kids and the young at heart” So please if you are around this Saturday and would like to help us deliver any of that it would be much appreciated. Any one fancy baking us a cake or flapjack or buns? Let me know! As it’ll also be a usual open day there’ll be the usual jobs list (in it’s new revolutionary form!) AND we are expecting a visit from the Lord Mayor at 10:15 so it’d be great if some early birds were around then to chat to him about all we have achieved. 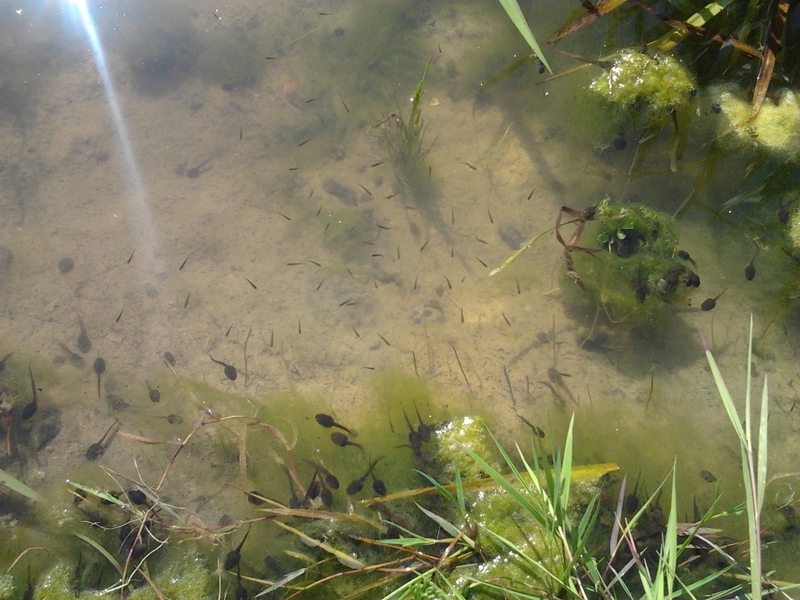 Also check out some surprise new arrivals in the pond! Can you spot them? Who knows who they hitched a ride in with!?! This entry was posted in News from the Garden on June 4, 2013 by GHCG.